Otto Dix willingly joined the German army at the outset of the First World War and as a machine-gunner experienced artillery bombardment and hand-to-hand fighting in the trenches. In the early 1920s Dix felt sickened by the collective desire of so many civilians to forget the war and in response wanted to create a painting of gut-wrenching impact. 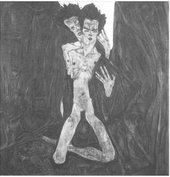 The resulting frank depiction of death and dismemberment in the trenches caused a public outcry when it was bought by a Cologne museum in 1923. In 1937 The Trench was confiscated by the Nazi regime and included in the infamous Degenerate Art exhibition. This show, which proved extremely popular, vilified modernist art as mentally ill, artistically bankrupt and, especially in the case of Dix’s The Trench, unpatriotic. In 1939 several hundred modernist artworks were burned by the authorities in an open bonfire in the Berlin fire station. For many years it was thought that Dix’s The Trench was among these. But a bill of sale to an art dealer who worked with the Nazi authorities indicates that the painting survived at least until January 1940. What happened to it thereafter is not known. The work may have been looted amid the confusion of the end of the war, but no trace of it has been found over the last seventy years. In all, no fewer than 260 works by Dix were confiscated by the Nazis and then sold or destroyed. But The Trench – described by a leading American curator in 1931 as ‘perhaps the most famous picture in post-war Europe … a masterpiece of unspeakable horror’ – was one of the most important. With its disappearance, a powerful statement of the impact of war was lost to later generations.